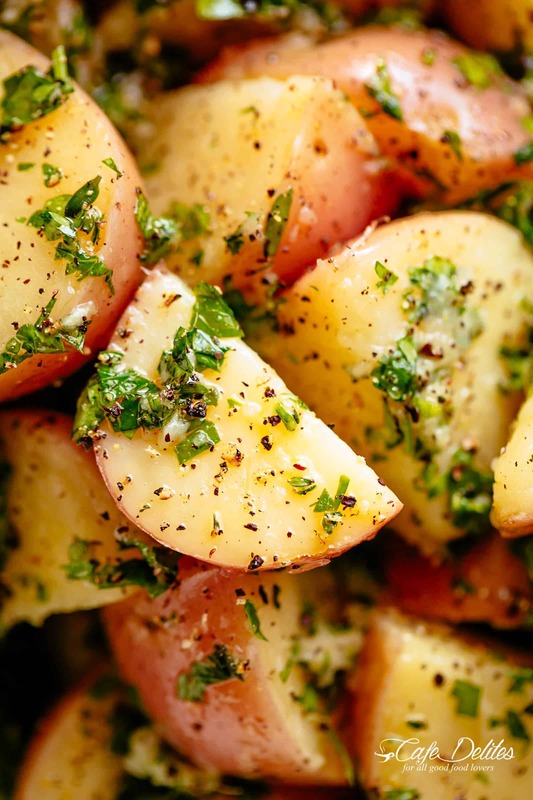 Garlicky Herb Red Potato Salad is ridiculously easy to make and packed with flavour! 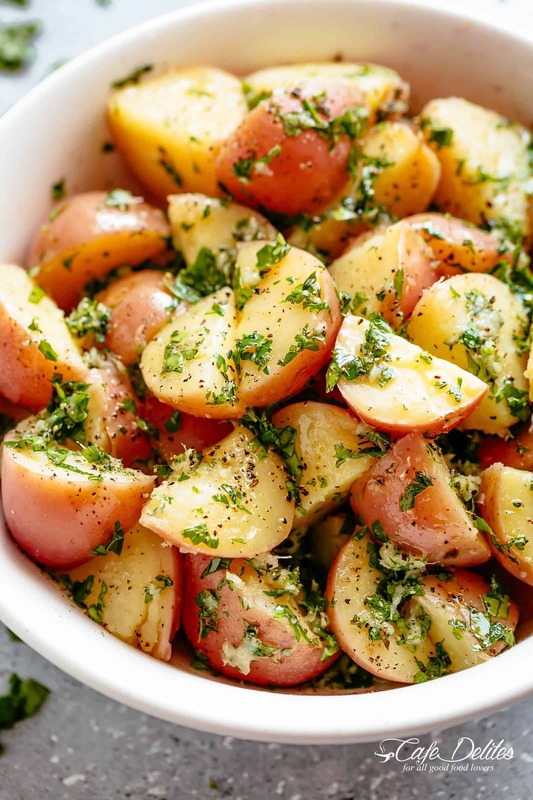 Slathered in the best and most delicious herb dressing with olive oil, a slight tang of vinegar, a kick of garlic and the most incredible flavours of fresh herbs, this Red Potato Salad Recipe will be a hit on your dinner table! 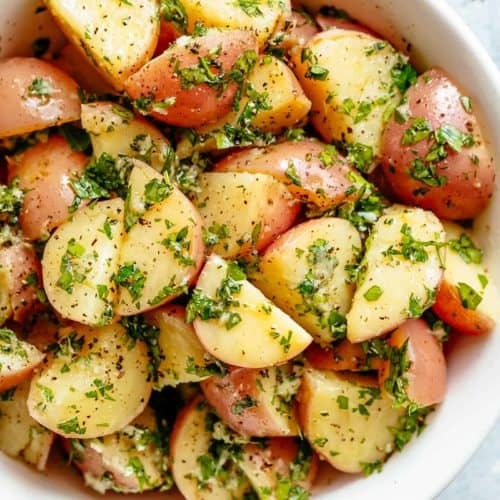 Potato salad would have to one the most popular side dish along with mashed potatoes, roasted potatoes and the most incredible smashed potatoes. Give me ALLLL the carbs! Most potato salad recipes are coated in a luscious mayo dressing (like this one here, with bacon and dill pickles). This potato salad needs NO MAYO or sour cream! As with all potato salad recipes, potatoes are boiled in salted water first until fork tender. Drain potatoes in a colander, then rinse them under cold running water for about 30 seconds to one minute to take the steam out of them and stop the cooking process. From here, I like to spread them out on a baking sheet or tray to allow them to cool completely or until cool enough to handle and avoid them mushing through the dressing. You can also refrigerate them to cool them quicker. While potatoes are cooling, use this time to mix up your salad dressing! Feel free to substitute any of these for others you have on hand, including dill, tarragon, oregano or basil. Looking for more sides? Try these! Garlicky Herb Red Potato Salad is ridiculously easy to make and packed with flavour! 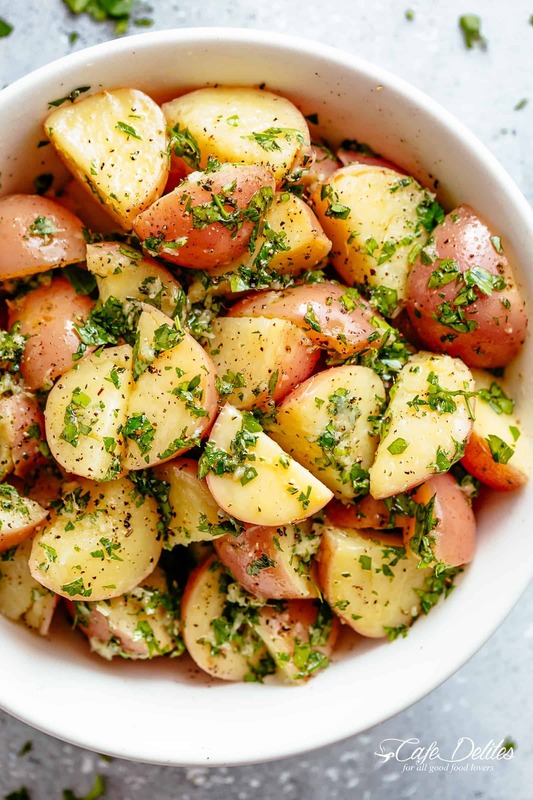 Slathered in the best and most delicious herb dressing with olive oil, a slight tang of vinegar, a kick of garlic and the most incredible flavours of fresh herbs, this Potato Salad Recipe will be a hit on your dinner table! Bring potatoes to a boil in salted water over high heat. Reduce heat to medium and allow to simmer until fork tender (about 10-12 minutes). Drain in a colander and rinse under cold running water. Spread out onto a baking sheet to completely cool potatoes (about 10 minutes). While potatoes are cooling, mix together olive oil, vinegar, garlic, salt, pepper, parsley, thyme and rosemary. When potatoes have cooled to the touch, transfer to a serving bowl. Pour dressing over top and gently toss through to evenly coat. Taste test and adjust salt, pepper or herbs if desired, to suit your taste.